The Barracks (Halekoa) is now available for your special event. 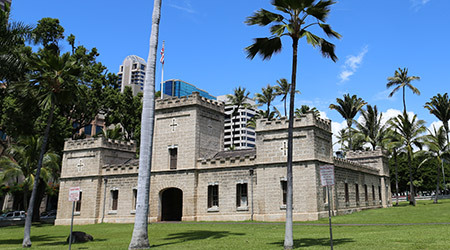 If you need a fantastic new location for your MCI groups for Meetings, Conventions and Incentive Groups, as well as wedding reception, or to host a business luncheon, intimate dinner party or your corporate holiday celebration, consider the historic Halekoa, the Iolani Palace Barracks. An amazing venue day or night, the coral block structure of limestone with its crenelated parapets and towers hearkens to the architecture of medieval castles of Europe.